Readings in American Foreign Policy delivers a contemporary introduction to America's role in world affairs. Useful alone or as a supplementary reader for undergraduate American foreign policy courses, the second edition focuses on the most current problems and how to interpret them. Readings are divided into six parts and each part opens with an introductory essay providing students with a historical framework and "big picture" questions to guide comprehension. Each part incorporates a variety of sources, including not only articles from the most popular journals worldwide, but lesser known government documents and think tank pieces. 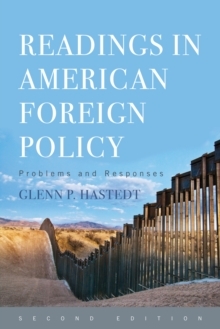 By exposing students to a unique array of government policies and debates, Readings in American Foreign Policy prompts students to analyze policy making from multiple perspectives and to develop their own strategies toward evaluating policy positions.